Helping make your site trustworthy, fast and show up in Google. It’s a big enough deal that the government has made a site especially to teach people about it – have a look here. Simply put, an SSL Certificate is a special piece of technology that encrypts the traffic to and from your website and in doing so adds an extra layer of security. This extra security means that if a hacker intercepts the traffic, they can’t read or change it. An SSL Certificate is what changes a site from HTTP to HTTPS site – the ‘s’ standing for secure. You can tell a site has an SSL Certificate and uses HTTPS as the browser will show a padlock and the word Secure next to it. Your site will have an added security layer evident to users and that builds trust. 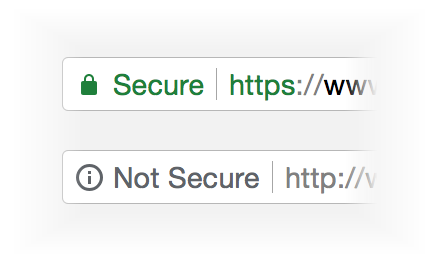 The green padlock and ‘Secure’ in the URL bar lets users know the site is safe. From July 2018 browsers will begin to show an alarming “not secure” notice for sites that don’t have SSL Certificates – suffice it to say this isn’t good for user confidence! Using the HTTPS protocol means your site will load up to 80% faster. Learn more about the difference HTTPS makes here. A faster load time means that (a) users have a better experience and (b) search engines will view the site more favourably (i.e. you will rank higher). SSL/HTTPS is a factor search engines take into account when establishing search ranking. Google is pushing the initiative to have all websites SSL secured and they are now heavily penalizing websites without SSL – they will do this by pushing your website down the ranking. What happens if I don’t have an SSL Certificate? If you don’t have an SSL Certificate the site will suffer in the following ways. Browsers will display a disconcerting “Not secure” message to users. You will lose consumer confidence – this is especially true for e-commerce sites where users are especially security conscious. The site will take longer to load which will annoy users. The site will perform worse in search engines and less people will be able to find it. The good news is that we install SSL Certificates as standard on all websites we make! SSL Certificates are renewed annually on the anniversary of your site launch. If you have a special requirement for an advanced or extended SSL Certificate please get in touch.